This unidentified albumen photoprint was taken from an album which bore the signature of public servant, author and painter John Rae, a self-taught early amateur colonial practitioner of collodion photography. 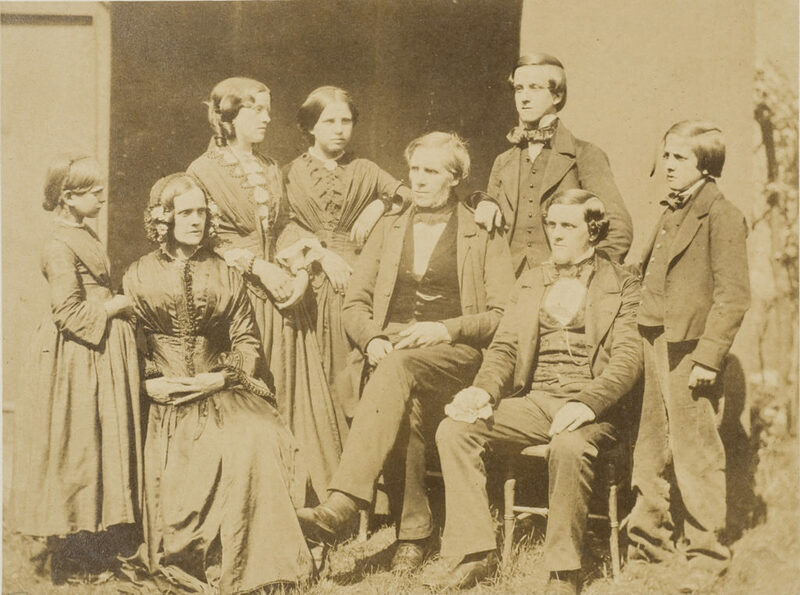 The subjects of this unknown family portrait are posed, either seated or standing, in a domestic garden setting with the wall of a building and a plain dark drop sheet forming a backdrop. All appear to wear comfortable, well-worn clothing reflective of informal everyday dress in the mid-nineteenth century. a father, seated at centre, with an older (teenage) son, standing behind leaning his right arm on his father’s right shoulder, the eldest son seated on his father’s right, and the youngest son [aged 10] standing in left facing profile, wearing a type of short jacket, cut along the line of female fashions, reserved for juveniles under the age of 12. The other male members of the family wear an array of single-breasted, narrow-sleeved woollen jackets and trousers over white shirts with pointed collars, individualised by their choice of waistcoat (either in velvet, brocade or cloth) and neck cloths or silk bow ties of varying magnitude and stylishness. The two older men wear square-toed, elastic-sided leather boots and display their fob chains, anchoring pocket watches, draped across their torsos. All wear their hair with low right hand partings. John Rae (1813-1900) migrated to Australia from Scotland in 1839 to work in Sydney. By 1843, he had been appointed Sydney’s first Town Clerk and later occupied in various public works positions. He was also a talented amateur artist, painting watercolours of Sydney streets and making a camera obscura to contribute to his panorama of Sydney Harbour – perhaps his best-known work is his 1850 watercolour of the turning of the first sod for the first railway. In the 1850s Rae became interested in, and taught himself photography, initially to record details for later paintings. In September 1855 he gave two lectures on the subject of photography at the Sydney Mechanics School of Arts, subsequently excerpted in the Sydney Morning Herald (see 14/9/1855, p.8; 21/9/1855, p.2.) encouraging other amateurs to take up collodion work. In these letters Rae writes about his personal affairs, his lectures at the Sydney Mechanics’ School of Arts, and his experiments with various photographic techniques. There are also sketches by Rae of the camera he designed (p.678).